The Lawrence Wilson Art Gallery is a centre for critical and scholarly engagement with visual culture. Located within the beautiful grounds of the University of Western Australia, the Lawrence Wilson Art Gallery is regarded as one of the finest university galleries in Australia. The gallery presents a diverse exhibition program each year, including works from The University of Western Australia Art Collection, historical and contemporary art as well as travelling exhibitions. Each exhibition is accompanied by a range of academic and public events, most of which are free to attend. They include artist talks, curating forums, lectures, presentations, workshops, symposia, conferences and performances. These events bring together practicing artists and specialists, along with teaching and research staff from the University with the aim to engage with students and staff on campus, as well as the wider community. 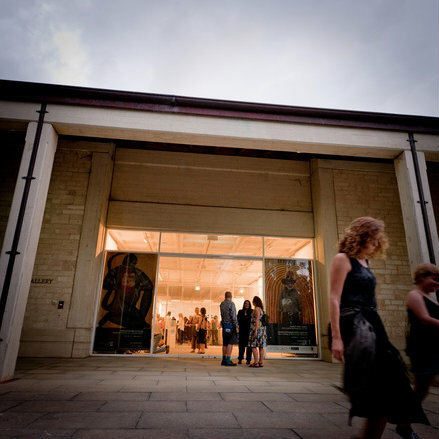 The Lawrence Wilson Art Gallery is part of the University Art Museums Australia network of galleries. Find out more about our current exhibitions and events. The University of Western Australia Art Collection was first given exhibition space in 1973 when the undercroft of the University’s Winthrop Hall was converted into The Undercroft Gallery. It became a vibrant venue for the display of both contemporary and historical Australian and Western Australian art. During the 1980s the decision was made to raise funds for the construction of a purpose-built art museum. It would be the first in an Australian university and would provide museum quality storage facilities for the UWA Art Collection and dedicated exhibition space. The Lawrence Wilson Art Gallery was opened in 1990. The building was constructed very largely with funds raised from alumni, public and corporate donations, and was designed by Western Australian architect Gus Ferguson. The Lawrence Wilson Art Gallery now houses the UWA Art Collection, the Cruthers Collection of Women's Art and the Berndt Museum Collection.